I am gearing up (yes, pun completely intended!) for the 2009 Tribecards Scratch-card Tournament that will take place next season. In the process of securing autographed, game-used, and serially-numbered cards, I bought a group of about 20 cards. Not all of the cards were listed in the auction, so I only had a vague idea of what I was getting. In among the other cool cards were TWO TRIBERS!! I got Pronk'd! 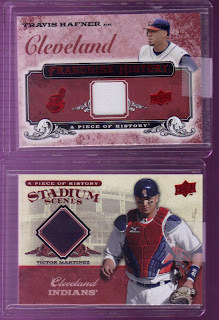 The top card is a 2008 Upper Deck "A Piece of History" Franchise History game-used ... umm... well, I don't know. Is it a jersey? Pants? Sock? All we know from the back is that it is a 'piece of memorabilia.' Works for me!